Roger Federer looks to prove the world wrong over the next two weeks, and show that he still has what it takes to capture a big time championship. Can he win the US Open for an amazing 6th time? -1. Andy Murray is looking to secure his first Grand Slam Championship. The British phenom has been near the top of the tennis game for some time now, but has never been able to take home the big pay-day. Will his luck change in Flushing? -2. Rafael Nadal looks to complete the career “Grand Slam” by capturing the one Grand Slam event that has eluded him in the past. After two consecutive semifinal appearances in Flushing, can Rafa demonstrate his all around toughness on the hard courts of New York? -3. 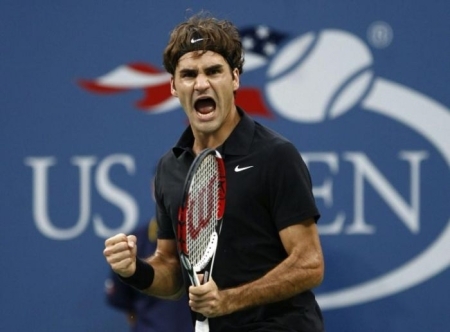 Can Roger Federer prove to the world that his reign is not over yet and capture his first US Open title since 2008? He was the runner-up in New York last year, losing in 5 sets to Juan Martin Del Potro (who will not be playing this year). -4. Can an American end the 7 year drought of Grand Slam Championships? The last time an American male captured a prestigious Grand Slam Championship was in 2003, when Roddick took home a title at this site (the US Open). So these are the 4 key questions to the tournament in my eyes. Lets delve into some answers. 1. Andy Murray is more than capable of bringing home the first Grand Slam title of his career here. Murray possesses an outstanding all around game that fits perfectly for the hard courts of Flushing. He has proven that he can beat the big dogs lately, by knocking off both Federer and Nadal in straight sets in Toronto. So definitely do not overlook Murray, who is ranked 4th heading into this event. I will state though, both Nadal and Federer’s hunger to prove the naysayers wrong will not help Murray’s chances though. Look for Andy to go deep as usual, but to come up short, in either the Semifinals or the Finals. I would expect a Semifinal exit though. 2. Nadal is more than ready to take home the one Grand Slam that has eluded him during the course of his stellar career. He currently holds the number 1 ranking. He has won 5 titles this year. Has a combined 52 and 7 match record. Plus he is hungry. Expect this guy to roll into the Finals for a date with his old nemesis Mr. Federer. Rafa plays every point like it is his last and will cruise his ways into the Finals. Counterpunchers can be quite dangerous on the hard courts of New York. Sure he will have challenges such as a possible date with Andy Murray, but it is very hard to stop this guy when he is motivated. I expect Rafa to come up just short though and lose in the Finals due to the fact that another man is even more motivated, Roger Federer. 3. Roger Federer will shock the world over the next two weeks and take home an astounding 17th Grand Slam title. I am not sure what it is about this guy. All directions are pointing against him capturing a 6th US Open title. But I for some reason feel like this guy has one more big time tourney left in him. And this is the one. Sure Wimbledon has always been his playground, but he has not exactly been a slouch in Flushing over the years. Look for Roger to upset his old nemesis, Rafa, and prove to the world that even at the age of 29, he is still capable of playing like the best player in the world. 4. This will not be the tournament that an American will end the 7 year drought. Guys like Nadal, Federer, and Murray are just too good to all go down here. But I will state, guys like Roddick and Fish could both go deep. They have both played outstanding this summer and have each enjoyed success in the past in Flushing. All 4 of the top Americans, have had their best Grand Slam finishes in Flushing during their careers. Coincidence, I think not. Roddick captured his only Grand Slam title here in 03. Fish, made the quarterfinals in 2008. John Isner made the 4th round in 2009. And Sam “the man” Querrey made the 4th round in 08. I definitely would not be surprised to see at least one of these four guys, maybe two of them if we are lucky, sneak into the Quarterfinals. But do not expect one of them to take home the hardware. It would be one of the most improbable runs in history. Kevin Durant is looking to lead a young Team USA squad to it's first FIBA World Championship since 1994. Team USA continues to roll and show the world that even without our cream of the crop superstars, we can still be dominant. And many are probably saying, hold your horses. It has only been two games. The team has not played any of the major threats yet. And when they did play a tough competitor, they squeeked out a win by the smallest of margins (86 to 85 exhibition win over Spain). Now I will admit, I had my doubts about this team when I heard that Kobe, Lebron, Melo, Dwyane, nor Dwight Howard would be playing. And frankly, I still do. But this team little by little is starting to put my mind at ease. They are young. Full of speed. Boasting with athleticism. Long at every position. They have some great shooters. And they are being led by Coach K, who all he knows how to do is Win, Win, Win. I realize, this team still has three more pool play games before they even advance into the real tournament play. 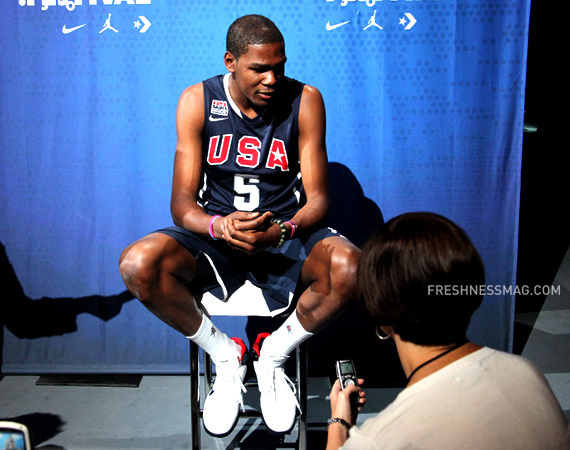 Can Kevin Durant and the boys take care of business against Brazil, Iran, and Tunisia? You better believe it. But the real questions start to arise when this team has to take on teams like Greece, Spain, and Argentina. Well have no fear, Kevin Durant is here. This guy is the real deal. He is a shooting star that is still only 21 years old. He has quickly developed into one of the top all around players in the NBA, and possibly the best all around scorer. The kid has length, athleticism, and a pretty stroke. No team in this entire tournament, much less probably in the NBA, can really check this guy. Not to mention he has players like Derrick Rose, the human fast break himself to dribble drive and free him up. I mean take a look at the US starting lineup. A major strength that top teams in the NBA have as of late is great length at every position. Durant is 6 foot 9 and long. Iguodala is 6 foot 6 with phenomenal athleticism. Lamar Odom is 6 foot 10 and reminiscent to a tree. Plus our backcourt of Derrick Rose and Chauncey Billups are both 6 foot 3 guys who can really get up and down the floor. I will admit when Coach K picked this team, I did not understand why guys like OJ Mayo or Rajon Rondo did not make the squad. But now after seeing this team play, I am seeing the logic. He has a great chemistry going with this squad with a group of guys who really complement each other well. This has been a problem for US teams in the past, who have not been able to capture the FIBA World Championships since 1994. Talent is not everything. Sure it helps, but it will not win you a major title by itself. Coaching, discipline, and overall team chemistry are what will take you to that Championship level. This team appears to have it all. Look for Team USA to go all the way and bring back the FIBA World Championship to the United States for the first time in 16 years. Bill Simmon's "30 for 30" documentaries idea has taken the sporting world by storm over the past 11 months. This has been a common thread for me and many other sports fans during the past 11 months for these “30 for 30” specials. These specials have truly become a phenomenon. And rightfully so. The idea originated from one of the best in the business. One of the guys in the sporting world, that whether you agree with his opinions or not, you are still going to read his column. And his columns are some of the longest I have ever read regarding sports, but you better believe I read every word. None other than Boston’s biggest homer, the “sports guy,” Bill Simmons. Simmons proposed the idea because he felt that some of the events that have occurred during the past 30 years, throughout the ESPN era, could really be more than just a another blip on the radar. They could be turned into documentary specials. There are many fine directors out there. Why not really delve into some of these special events and capture the interest of current, past, and future sporting fanatics? The first special of the 32 part series filmed in October of 2009 documenting the story of “The Great One,” Wayne Gretzky, leaving Edmonton for Los Angeles, and completely changing the scope of the NHL. 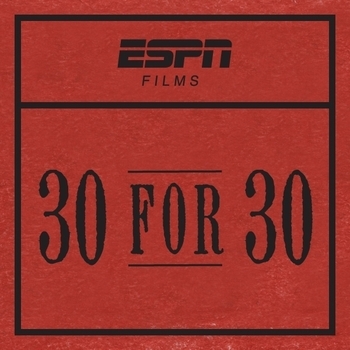 Other “30 for 30” specials that have really caught my eye have been “Muhammad and Larry,” “Without Bias,” “The U,” “Winning Time: Reggie Miller vs the New York Knicks,” and last evenings, “Jordan Rides the Bus.” In total 18 of these 32 specials have aired. And you better believe I am hyped for the next 14. I will admit I love Sportscenter and all of the shows that the greatest sporting network in the world (ESPN) has to offer. Even at times if items get entirely too repetitive, that is all a part of the world we live in today. Communication is constant and connectivity is at a premium. But these specials, are done so well, are extremely informative, and very entertaining at the same time. I guess that is what you get when you take big time directors and let them put out footage on sporting events. Last evening, really brought back some memories of my young childhood. I mean I could not have told you all the details of what had happened when Jordan left the League to pursue an ambition of playing professional baseball. I was just a little kid. This special last night though, provided me and probably the rest of America with some much-needed perspective. I mean how many people knew that Terry Francona, the current manager of the Boston Red Sox, was Michael’s manager for the Birmingham Barons? These specials in essence, connect the dots for people. They bring these major stories of the past to life and provide some closure. Many of these stories may have been analyzed and shown on various sporting news shows over the years, but never has their been a major director showing the facts through expert cinematography. So thank you Bill Simmons. America appreciates you coming up with this simple, yet innately innovative idea. And make sure to tune in next week for the special entitled, “Little Big Men,” which will document when the 1982 Kirkland, Washington All Stars shocked the world, and brought the Little League World Series Title back to the United States. 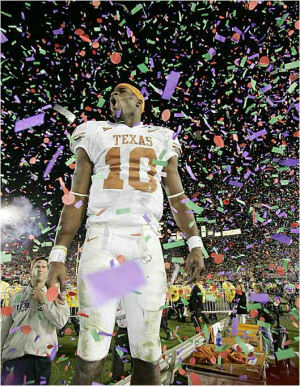 Vince Young shocked the world in January of 2006 when he defeated Matt Leinart, Reggie Bush, and the mighty USC Trojans. Last night, he once again showed why he owns Matt Leinart. Last evening, America got to witness a familiar sight. A blast from the past. Matt Leinart and Vince Young were once again competing on the football field. Different times with much different personnel, but a very similar result. Now I realize it was just a preseason game, and it is hard to judge much from these “pretend” games as many like to call them. But Young once again demonstrated why he has, and will most likely continue to be, the better pro quarterback than Leinart. Welcome to the 2005 BCS National Championship. Seemingly a home affair for the heavily favored Trojans in Pasadena. USC was leading late in the game and Matt Leinart was putting up another strong performance. But the real story of the game was the amazing play of Vince Young. The guy accounted for 467 total yards of offense, which is a mark that has never been touched by another player in a BCS National Championship game. Not to mention he led his team to 41 points against a very tough USC defense. How didn’t this guy win the Heisman Trophy, I, and many other people wondered? Either way, late in the 4th, Young scampered into the end zone past a diving Frostee Rucker to secure the stunning upset victory for Texas. It was the end of a Trojan dynasty. And little did we know, not only was this the beginning of the end for the program, but it was also the end of Matt Leinart as we knew it. In 3 years as the Trojan starter, Leinart threw for over 30 TDs and less than 10 INTs each year. He also completed over 63% of his passes, won a National Title, and won a Heisman Trophy. Vince Young also was a starter at Texas for 3 seasons. In his first 2 years as the starter, he threw for 18 TDs and 18 INTs. Very modest numbers to say the least. But he was still finding ways to lead the Longhorns to victories. Do realize that he rushed for a combined 2,074 yards in these first 2 years as the starter as well. He was not your prototypical NFL pocket assassin. As a senior though, his game began to gel on all cylinders. He threw for 26 TDs and only 10 INTs. He also rushed for 1,050 yards and 12 TDs. The man was doing it all. Looking reminiscent of Michael Vick at Virginia Tech. Well the BCS National Championship Game marked the end of an era for Leinart. And apparently the beginning of a new era for Vince Young. Come April 29th, 2006, NFL Draft Day. Mel Kiper had been stressing for months what a great class that was coming out. Guys like Reggie Bush, Mario Williams, AJ Hawk, and how there were 2 can’t miss QB prospects. The draft started out with a major debate as the Texans took defensive end Mario Williams rather than “Heisman Trophy” winner Reggie Bush (appears to have been the right decision now). Following this, Vince Young was the 3rd overall selection, while Matt Leinart fell to 10th overall. I was in disbelief. Leinart had the look of a big time NFL quarterback and had all the tools. He was 6 foot 5, had a strong-arm, a pocket presence, and had that Tom Brady like moxy, or so it seemed. Vince Young reminded me of Michael Vick. And guys like Michael Vick could get teams victories in the League, but guys like Tom Brady and Peyton Manning were the pocket guys that could bring teams Super Bowls. Sure Vince Young would be fun to watch I thought, but Leinart would be the one hoisting up the Lombardi Trophy in a February within the next few years. Boy was I wrong. Now I will admit that neither of these guys have panned out to be superstars. But it appears Young just needed some time to adjust to the pro game and is slowly but surely becoming a solid NFL quarterback. Leinart on the other hand, not so much. For Leinart’s career, he has played in 29 total games over a 4 year stretch, throwing 14 TDs and 20 INTs. His passer rating has been a very subpar 70.8. Young on the other hand has played in 45 games, throwing for 32 TDs and 39 INTs. His passer rating has been an also subpar 72.3. But he is a guy on the rise. A guy who brought Tennessee back from the dead last season. Leinart on the other hand has not shown any signs of improvement. Will Young continue to soar into a star in this League while Leinart’s career continues to fizzle out and end in the near future? Or will these guys continue to compete for many more years to come in the NFL?